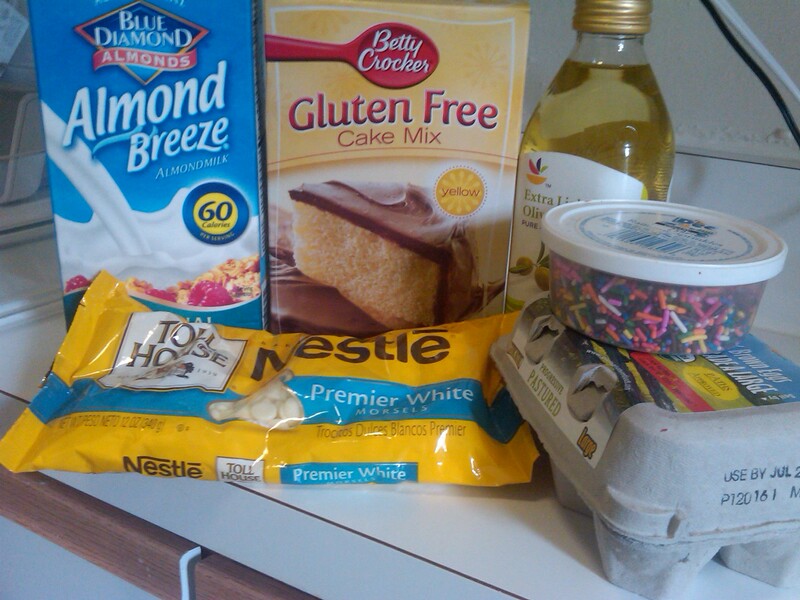 cake | Gluten Free? Gimme Three! On my first trip to the DC Grey Market, I was slightly disappointed with the amount of gluten free options. Although I did have some amazing nut cookies from Sweet Nuttings. 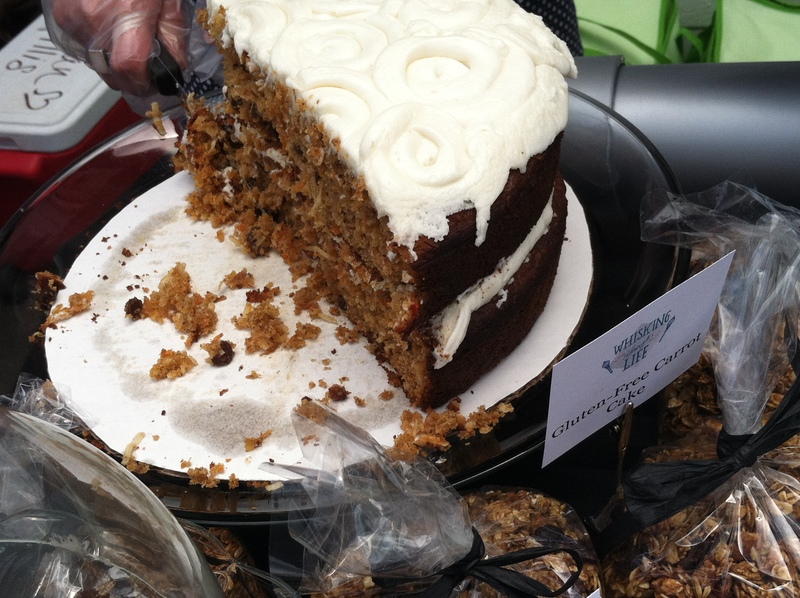 This time, there were two vendors with gluten free products. 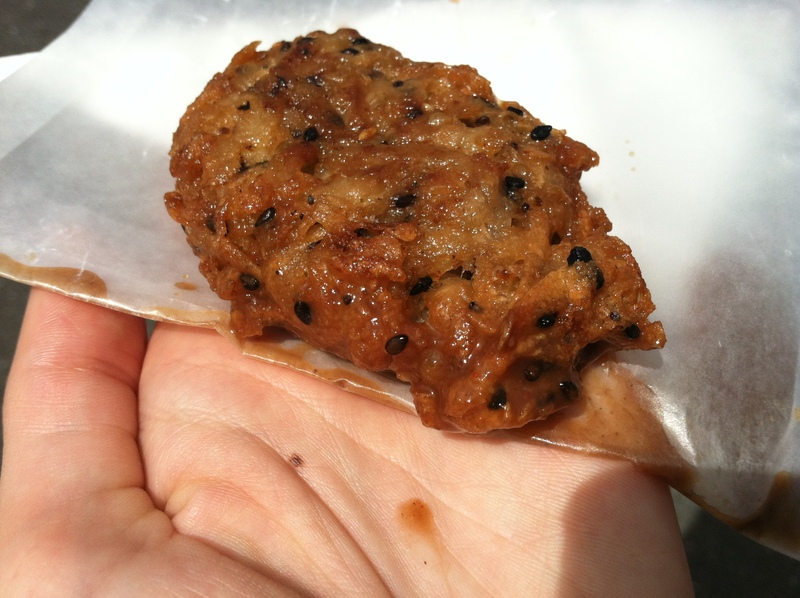 First up was savory taro fritters from Noshables. I was a bit hesitant at first because I wasn’t a fan of poi or taro when I went to Hawaii, but I decided to give it a go. It’s greasy, chewy, and unique tasting. Basically it’s ground or shredded taro, mixed with tapioca starch, sugar, and water – then rolled into balls and deep fried. A recipe for them can be found here. 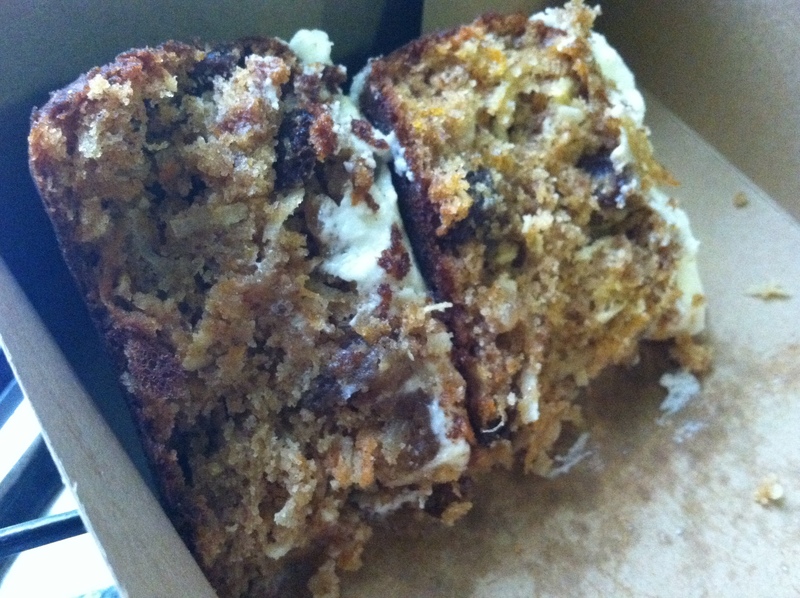 I ate that while I walked around looking for something sweet, which I found at Whisking Through Life in the form of gluten free carrot cake. Honestly I went against my better judgement in trying this cake because they had the samples of the carrot cake right on top of the regular samples, which indicates to me that the baker isn’t exactly stringent about cross contamination. But it looked so good, and the cake itself was separate from the other things, so I got a slice (and thankfully didn’t come to regret it). 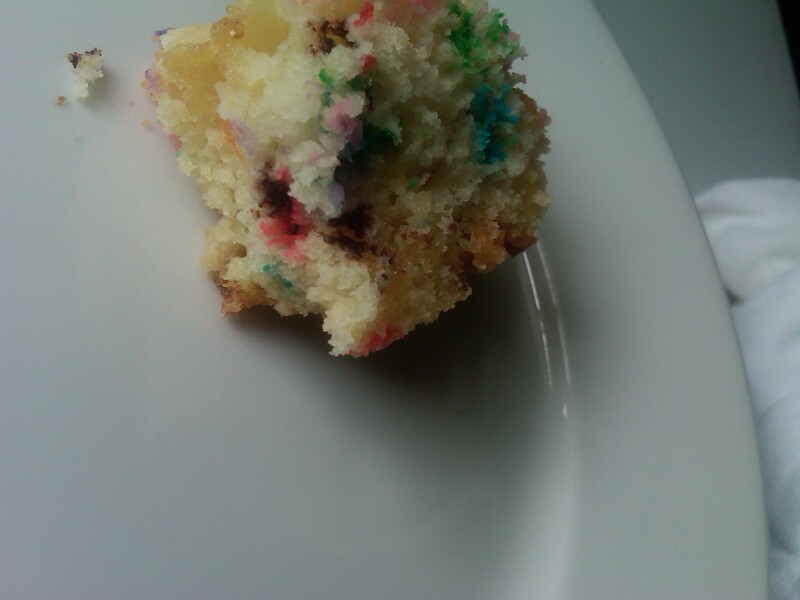 That’s after I ate half of it. It was really good! Full of grated carrots, coconut, and raisins. And the slice was so big it took me three days to finish. Next time hopefully my friend from Kate Bakes can get a spot at the Grey Market and up the representation of gluten free vendors! Now, doesn’t this look good? Well, it was. After trying the cupcakes and cookies at Sticky Fingers Bakery, I decided to give something savory a chance. 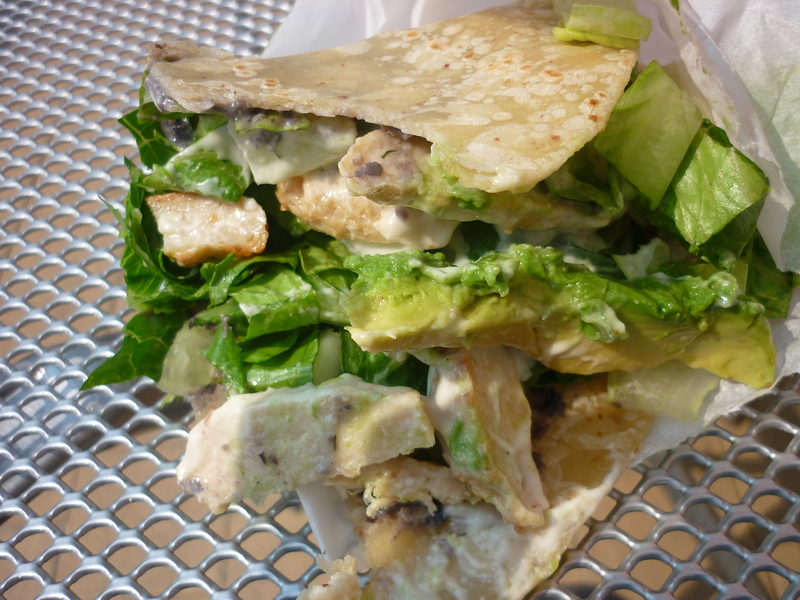 Enter the Chick’n Ranch Wrap. They didn’t have any gluten free bread when I went (boo), so I was relegated to the wrap section of the menu. 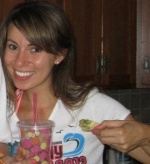 And this was a great choice – really refreshing, and I kind of love the soy chick’n strips? I don’t usually go for fake meat, but the mix of the avocado, creamy dressing, and crisp lettuce just worked. The only downside is that it was pretty small (aka normal portion sized), and cost $8.50. Egads. It made me miss the humungo wraps from Terri in NYC that only cost $7. I must find something that doesn’t fit into my hypothesis about DC food vs NYC food. Which is that everything is either A) half as good or B) twice as expensive or C) bland or D) A, B, and C all at once. Not to hate on DC or anything. But, come on, it’s no New York City. 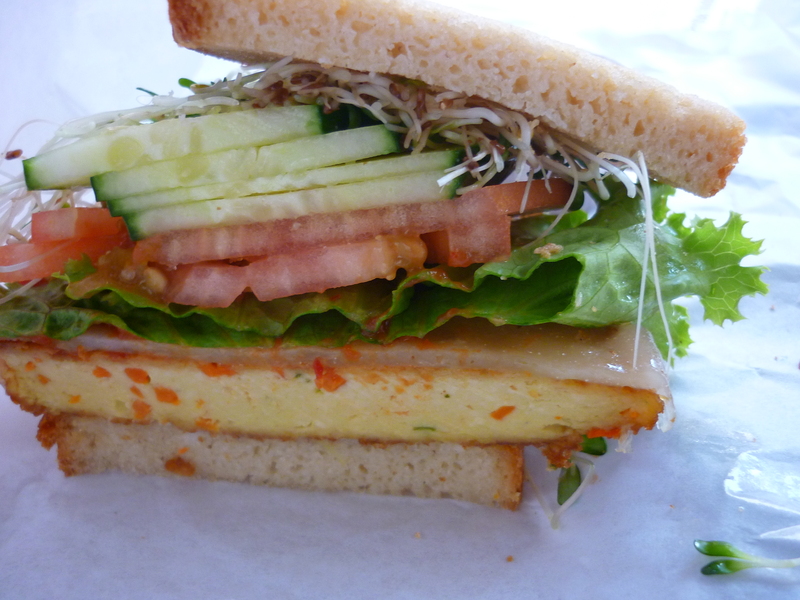 Case and point:the veggie burger from Java Green. Looks okay, no? It was… just okay. Maybe it was an ordering fail on my part, but when they say “spicy burger sauce”, I expect a giant burger slathered in sauce, this was some kind of appropriately-sized health food? Also similarly, cost $7 and I ate it in about 30 seconds. I had such high hopes for you, Java Green. At least they had an impressive selection of desserts to choose from provided by Sweet n’ Natural. 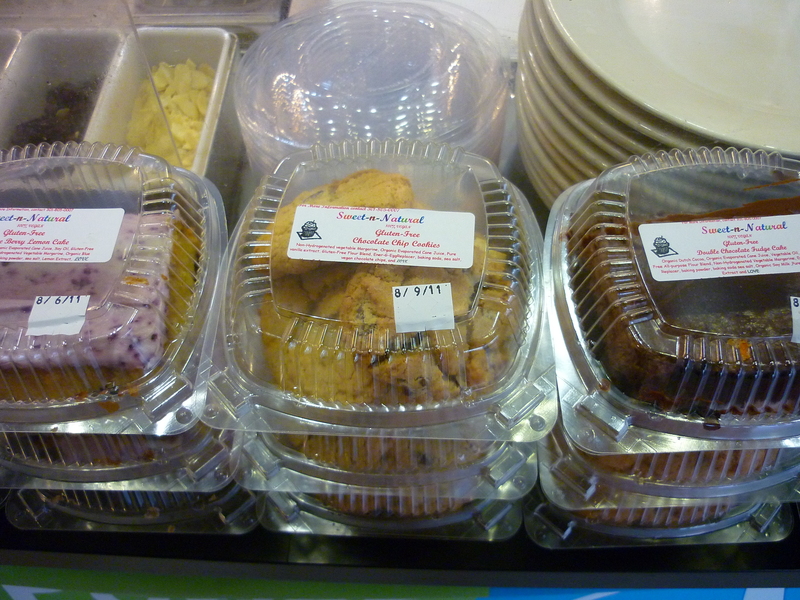 Chocolate chip cookies, chocolate cake, something with blueberry frosting, and carrot cake – which I will always favor. And it was good to the last bite. 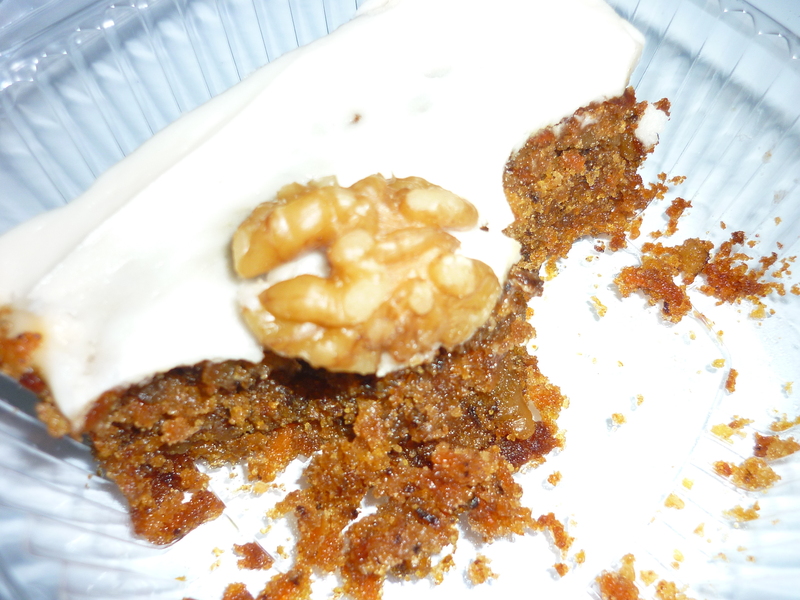 Not quite as good as the carrot cake sold at Mozarelli’s in NYC (can you tell that I’m a bit homesick for NYC these days? ), bust still a great piece of cake. 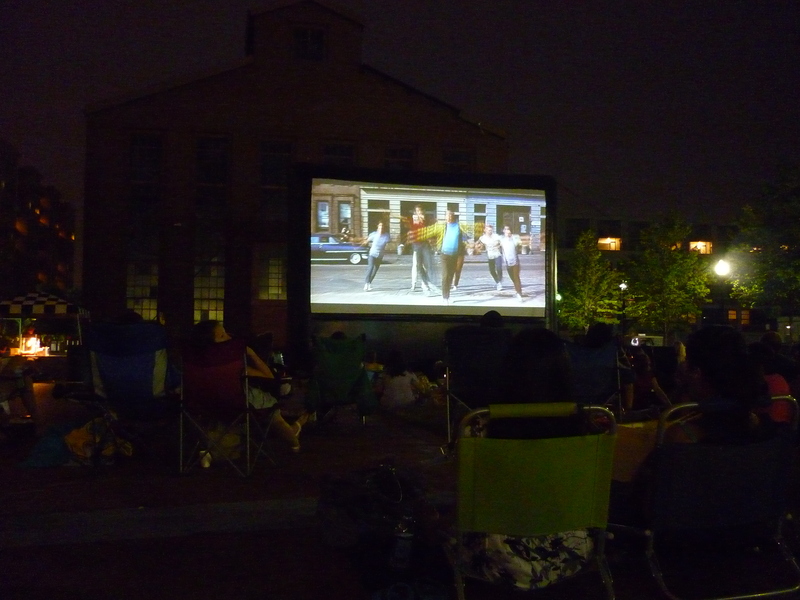 At least the sandwich gave me enough fuel to get to the outdoor showing of West Side Story in Navy Yard. Oh yeah. The dialogue in that movie is hilarious. At the most serious/heart-touching moments the entire crowd was roaring with laughter. Also after some initial Googling – I found this awesome spoof video “Web Site Story”… oh, the Internets. Directions: Combine the first four ingredients in a large bowl. 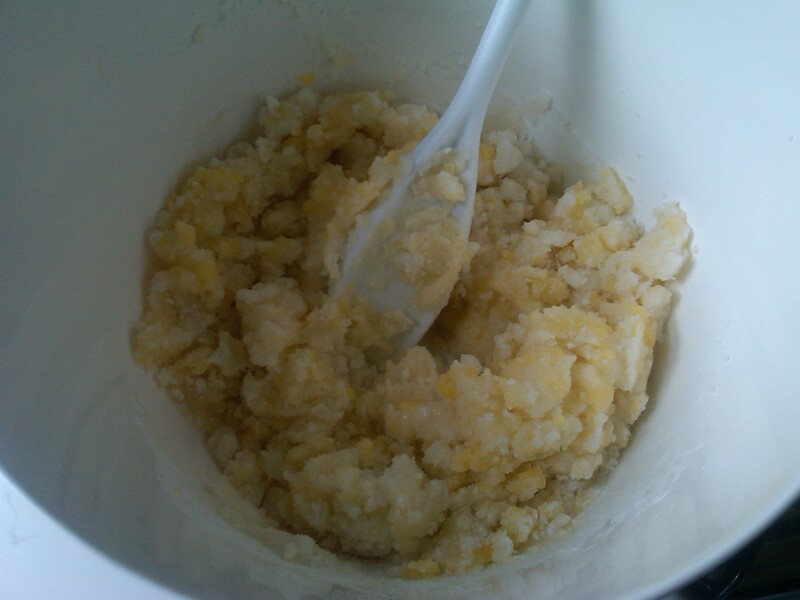 Add the milk slowly – you want the batter to remain as dense as possible. 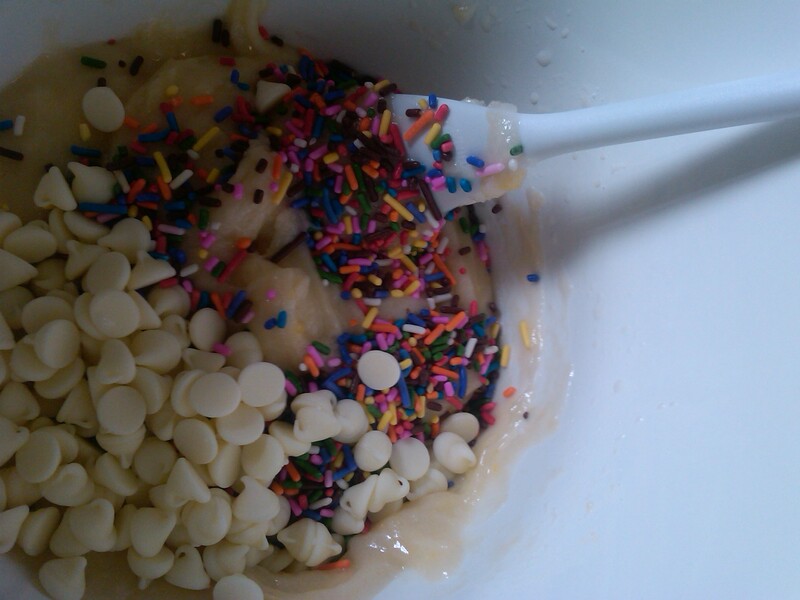 Then mix in the rainbow sprinkles and white chocolate chips. Bake for 30 minutes at 350 degrees. Pull them out just when the edges are starting to turn brown, and cool for about 20 minutes. 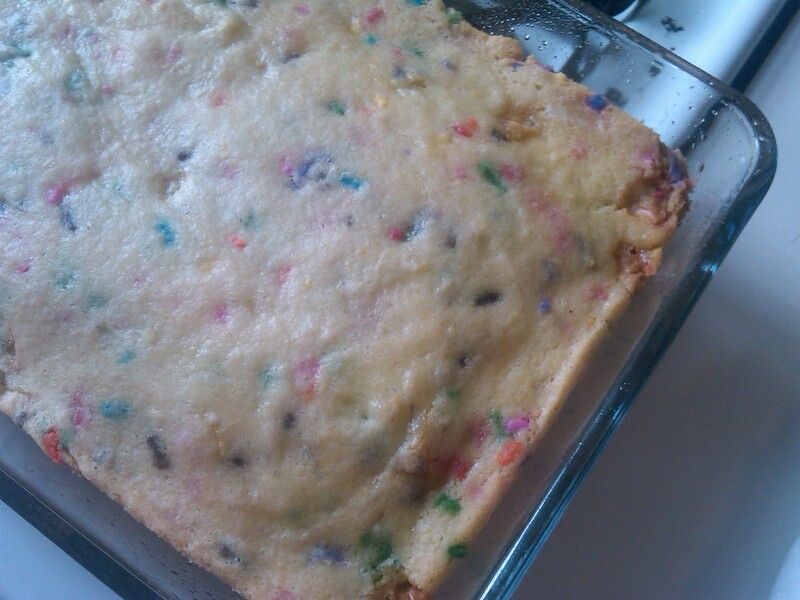 These weren’t as gooey as Gracie’s were, or at least how they looked, which might have to do with the gf batter mix. But they were still outrageously good. I’m going to have to try to resist eating all of them before I bring them in for my coworkers tomorrow. Chelsea Clinton will be serving gluten free cake at her wedding! Who knew that Chels herself has a gluten allergy? Pretty neat!